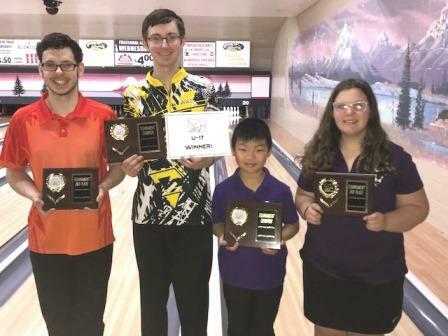 John Malone and Nathan Tang each captured their first career JBT titles, in exciting Pacific Northwest Conference action at Everett's Evergreen Lanes. Malone got past Tyler Hogstrom in the semifinal match of 'march madness' style matchplay 208-167, while Simon Dyck got by Tyler Denune in the other to set up the title match. In the final, Dyck and Malone remained all even until a crushing 4-9 from Simon followed by a tripped 4-9 from John opened up the match in Malone's favor. The 237-212 final score was good for the long awaited first title of his JBT career. Kierra Wilcox made her first career title match with a 235-185 win over Carter Humphries. Meanwhile, Tang pulled his second straight Houdini act, escaping 193-192 from Colt Jance, to move on to the final. The title game was close until 10 year-old Tang came up with a late frame turkey, blowing the game open. With his 238-194 win, Nathn earned his first career JBT title in his fist JBT event. Malone completed the dream day with a win over Tyler Denune for the U17 subdivision crown. 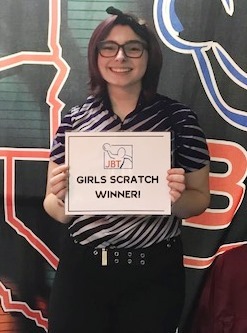 Priority Girls Scratch was won by WendyJo LaTurner, with a win over Evan Smith. Big thanks to the team at Evergreen for hosting our Tour. Want in on the fun? Just check out our schedule and come on down!